About | What's for Dinner? Hi, I’m Liz. Welcome to “What’s for Dinner?”, my little corner of the blogosphere! I’m a self-trained home cook living with my husband of 37 years in the beautiful Texas Hill Country. We have three grown children and four precious grandchildren. My friends and family all know I LOVE to cook and entertain, so I started this blog as a way to journal my time in the kitchen. I use fresh, in-season and organic ingredients when possible, and for the most part, we try to eat healthy. I believe moderation is key, so for those times you want to indulge a little, you’ll find recipes for that as well! Pull up a chair, grab a drink, and sit a spell…and thanks for stopping by! 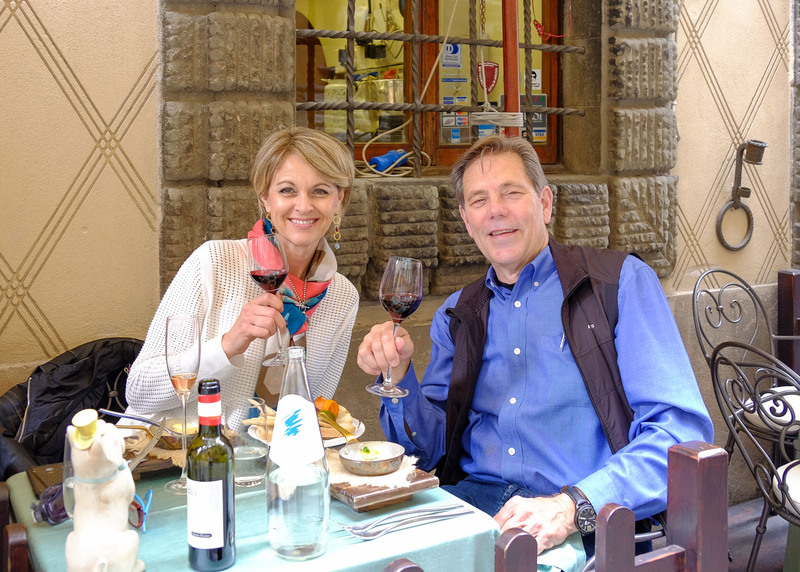 Enjoying Tuscany, one meal at a time! I just met your husband at Epicure. He shared that you had a food blog. I’ve checked out some of your healthy recipes and am inspired by your cooking. Will definitely try some of your recipes. Happy cooking. Liz, I’m glad to see you’re still keeping up with your blog. I love your style – thanks for the inspiration! Hope all is well! Hey, Liz! My name is Cathi. I live in Estonia and yesterday evening I got somehow into Your blog and wow…I think that You have really great recipes and beautiful pictures here 🙂 I can’t wait to try many of those 🙂 I’m writing also a blog here, in Estonia. At the moment I’m just a beginner and I don’t have a lot of recipes. At the moment I’m trying other people’s recipes but hoping to write recipes of my own some day. Well, after years of cooking and getting in a rut preparing the same ole meals over and over again, I’m excited to get some new ideas from your blog. I was scanning over your recipes and I was wondering if you have any suggestions for keeping the fresh herbs that some of the recipes ask for “fresh”. The fresh herbs are so expensive to be used once or twice and then waste the rest! Do you have a fresh herb garden or would you suggest dry spices? Hi liz, Becky sent me your blog about the ranch picnic and I love your website! I ahd no idea you were such a cook and columnist! I have already printed out some recipes! Was great seeing you both a the surprise party! Keep blogging!! I also love to cook and love your blog, it is wonderful hearing about how it is real life and the joy you find each and every day.I have had a bug to write blog placed on my heart for a while. I discovered yours this morning…love it! You have inspired me to take that next step. Wow Liz you are amazing! Love the food blog, you are an amazing cook and have such a talent. When is your debut on Food Network? I look forward to future post. I really enjoy reading these. I used to cook when the kids were home but now I only cook on rare occasions and for the dinner club. Reading your blog is inspirational. And it is good to know that there are others that love dark chocolate as much as I do. LOVE IT…..you go girl, looking forward to the future! I am REALLY enjoying your blog. I always like “talking food” with you and it’s a treat to sort of get to do it everyday. I predict you will have lots of followers! I have your recipe for “The Infamous Pasta Salad”. Love-love it!! It must be at least ** years old. Got it from the Hill Country Recorder. Tempt my taste buds sister!!! Great JOB!! You are an inspiration to all of us that love to cook!! Look forward to looking at your blog. Who would have thought from meeting you in a Thai store to this? I love your idea and can’t wait to see some of your creations. Liz, Thanks for introducing me to your blog and others. This is going to be fun. I can’t wait to see more! You inspire me! Liz – looks like you are off to a great start with your blog. I will look forward to following your cooking and recipes.